Copper deficiency is an important disease of cattle that produces several clinical signs and lesions, due to alterations in copper-dependent enzymes. One of the organs affected by this deficiency is the heart (falling disease), but nevertheless, these cardiac lesions have not been extensively studied in bovines. The aim of this work was to propose a possible pathogenic mechanism for cardiac lesions in cattle affected by copper deficiency. 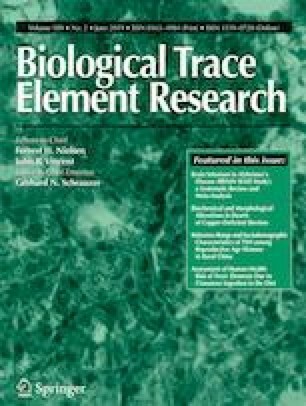 Because of the possible existence of oxidative distress caused by low levels of copper-zinc-superoxide dismutase and cytochrome oxidase, ultrastructural and histological lesions have been evaluated in the heart of bovines in which a Cu deficiency had been induced using high molybdenum and sulfur levels in the diet. Our results indicated that copper deficiency produces significant damage in myocardium with high levels of lipid oxidation and a significant reduction in copper-zinc-superoxide dismutase activity leading to an oxidative distress situation. However, cytochrome oxidase activity was not significantly reduced. Histological observation revealed a significant increase in the amount of connective tissue, enlarged basement membranes of myocytes, and numerous Anichkov cells, in the hearts of deficient animals. Ultrastructural observation showed a significant enhancement in the mitochondrial volume density, with presence of lesions such as swelling and cristae disruption. We conclude that copper deficiency in bovines causes morphological lesions in the heart due to an oxidative damage produced by copper-dependent enzyme alterations. All protocols for this study were approved by the Institutional Experimental Animal Care and Use Committee of University of Buenos Aires, Faculty of Veterinary Science (CICUAL).